Sweet Lobby brand leverages their extensive selection of treats with a Self-Serve Macarons Six-fer Offer. Nine separate mini Bulk Bin offerings line the glass-top Coffin Cooler, but it is the vertical sign that draws you toward the offering. Self-serve is the order of the day so you can mix and match to your hearts content. In case labeling defines the individual French creations. Bon appetite. 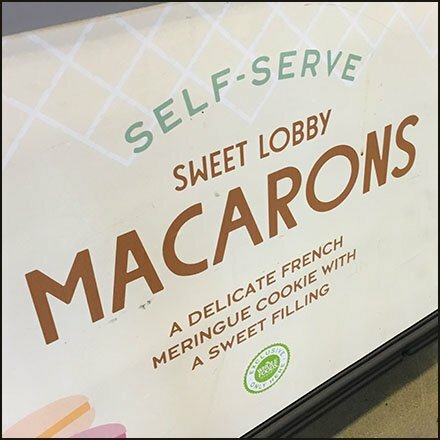 This Self-Serve Macarons Six-fer Offer courtesy of Sweet Lobby and Whole Foods, Allentown PA. Consider in the gallery of images.